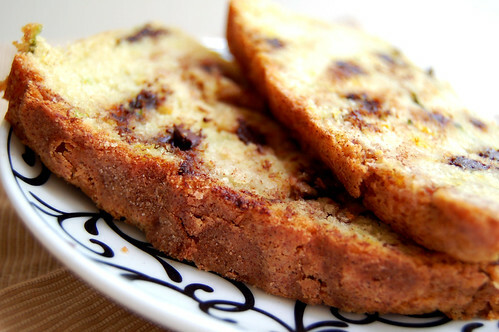 A wonderful chocolate chip zucchini bread with a crisp cinnamon-sugar crust. Heat oven to 350 degrees F. Grease and flour a loaf pan. Pour batter into prepared pan. Stir together additional 3 tablespoons sugar and cinnamon until combined. Sprinkle half over the top of the surface; using a knife, gently swirl cinnamon-sugar into bread. Sprinkle the additional cinnamon-sugar over the top. Bake for 1 hour-1 hour 10 minutes or until a wooden skewer inserted into bread comes out with moist crumbs attached. Cover bread with foil if it gets too brown. Cool 1 hour in pan, before running a knife around outside edges and removing. 50 comments on "Cinnamon Chocolate Chip Zucchini Bread"
It is an excellent way to get kids to eat their veggies!!! Looks good to me...if carrot cake can work, why not zucchini bread??? 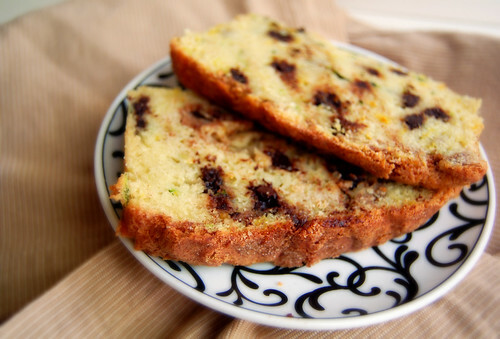 I love zucchini bread...add some chocolate and I'm sold! I like Art as well for his 'southern comfort', but he's too whiney. I love the way he calls the chefs honey though. Anita has no personality, talented though I'm sure. I want Rick to win. I'll have to look for that movie. Love me some Ed Harris, thought I would never thought that was him -- much prefer his balding look. Oh, and by the way, the zucchini bread looks awesome! Love the show, and I too have been torn about who I want to win! I think the combo of ingredients here sounds awesome, can't wait to try it! I can't believe I haven't posted about Top Chef yet. I will...today. I don't think Art should have gone. Anita doesn't seem like she wants to be there and HE did...A LOT. But that decision to buy "ice cream" was his fatal error. That bread looks great. I bet you don't even know it's zucchini when you taste it, not that that would be a problem for me. Homemade Caramel Macchiatos? I'm there! :) This bread sounds great to me. The husband told me last week that he tried zucchini bread at work and liked it (very surprising), so now I want to make some. This shall be the recipe! Thanks. MMMMMMMMMM,...this bread looks absolutely wonderful!!! I love Rick and Michael but I think Hubert is going to win. He is a great chef. Nice zucchini bread! I've been seeing all these awesome zucchini recipes and yours is at the top! It's the first I've seen that doesn't have chocolate (don't like)as a main ingredient. I really need to jump on the zucchini bandwagon before it passes me by like rhubarb did. Thanks for sharing I'm going to give this a try. Mmmm, that looks and sounds sooo good! I started out watching top chef masters and then stopped. I so need to get caught up. I saw a cc & zucchini bread and wanted to try it, so I might have to give yours a go. I love your recipes. Happy Monday? Maybe pushing it; but chocolate chips can usually win me round. This looks SO GOOD. Capital letter amounts of good, my word. Can you actually taste the zucchini inside? 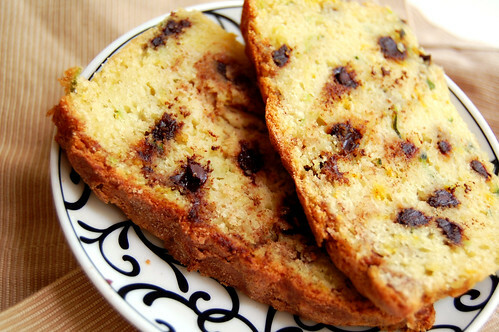 Because I am, er, not a zucchini lover, but somehow the idea of chocolate bread sounds better. Now if I can get veggies inside, that's for the better! If you say it's a good bread than I'll take your word for it. It looks great! unfortunately i dont watch Top Chef Masters. is it something like the UK's Master Chef? wow i sound like such a tv idiot. lol. anyway this zucchini bread looks lush!! lovin the flavours. i could do with that and some coffee now. mmmm. more zucchini love, that's what i like to see! and cinnamon, yay! meanwhile, i ADORE rick bayless and i've been rooting for him from the get-go. he's so genuine and his food always looks tremendous. The bread looks good and all, but where did you get those adorable dishes?!? Yum!! Your bread sounds delicious! I didn't read your first part (still haven't watched the DVR!) but the bread sure looks good! I'll take some of that coffee too. I could sit and talk shop all day! I'll miss Art, and Anita just seems like she doesn't want to be there. In the end, I think I'm pulling for Michael to win. I'm loving Top Chef Masters too! I'm sad now that I never went to Rick Bayless' restaurant when I lived in Chicago (I heard it wasn't very good, but I wish I would have tried it and seen for myself now). He seems like so much fun! That's about the best looking zucchini bread I've ever seen! LOL... I am still laughing at the similarity of those guys. And I can totally picture you walking by and staring at it! Hahaha! Anyway the bread looks and sounds totally scrumptious to me! I am going to try this one for sure. I'll have to pick up some zucchini at the farmer's market. Looks great! I love the crust on that bread. I have trouble with quick breads underbaking as well. They look so done, and even get TOO crusty on the outside, before the inside is done. Wow, this is a nice bread...such a great combination of ingredients...sounds and looks terrific...yummie! Anita is somewhat shy and modest. Her food is good eh? Em, everything you make is always so outstanding. You got the IT factor hon. Wow, that bread looks awesome. I have never understood the appeal of zucchini bread, but with the flavors and - most importantly, the chocolate - you have going on there, I'd probably eat half the loaf. Mmm, zucchini bread :) have you tried hershey's cinnamon chips?? YUM - I love the sound of that bread! LOVE zucchini bread in the summer, and I'll eat just about anything with cinnamon and/or chocolate chips in it. I'll have to try this! Another great-looking recipe. I love how you incorporate yogurt into your recipes--it is one of my favorite baking ingredients. I've been saving (hah, I actually forgot about it) some zucchini in the freezer; so here is an excellent excuse to use it. I need to find that Top Chef (have never watched it) and start watching it. I love Michael and Rick, too. Yummy zucchini bread. I think chocolate goes GREAT with it. Love the orange touch, too! Okay - we've been discussing Top Chef Masters around here. We had said that we found it a little boring compared to Top Chef, but we also took into consideration that the contestants on Top Chef are probably selected partially for their personalities. Whereas, Top Chef Masters spend all their time entertaining people with food and not really working on their tv personas. Was sad to see Art go, too. Anxiously awaiting the return of Chef Colicchio weekly. Have some zucchini (I know! It keeps coming!) on the counter. Will have to try this if I haven't eaten all the chocolate chips. Dude this looks awesome! Too bad I didn't plant zucchini this year (powder mildew killed them all last year and it was heartbreaking!) I may have to go buy some though! I wish you lived closer so I could give you all my zucchini, and you could make me all this bread. Yum. I was thinking that I was done with zucchini bread for the year, but these last 2 types you made sound too good to pass up! You could throw chocolate in almost anything and I'd eat it. Looks great! I haven't tried anything with zucchini yet, but you sure make me want to!! :) It looks delicious! 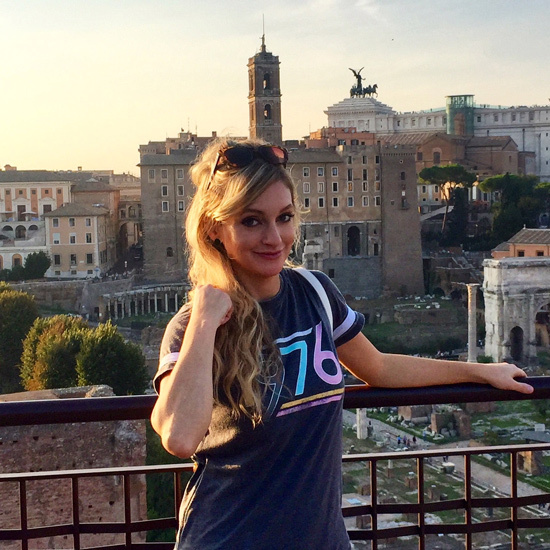 Oh my goodness I've just discovered your blog and I must say I ADORE it. This post alone encompases some of my favorite things - chocolate, macchiatos, & Bravo TV shows (particularly the top chef series). I, too, have been meaning to post about Top Chef Masters. But I'm not sure I have anything to add except I think Rick Bayless is a genius. What a beautiful bread, this is one I am going to try right now! I love bread and haven't had it in months, so maybe I should try and make this and have a slice or 5! I made this tonight, and I really love it! I did use 1/2 wheat flour though, and substituted honey for the sugar in the bread, (but still put the cinnamon sugar on top)! Thanks for a great recipe!